The skin is our boundary between us and the world and receives continuously mechanical signals from the outside, e.g. when being pushed around in a crowded tube or when feeling the calming touch of a friend’s hug. Similarly, the cells in our body and in other organisms are exposed to mechanical signals from their environment (other cells and tissue). Our research aims to understand, how cells detect these mechanical signals and how this affects their program and fate during development (e.g. to form well-defined organs and tissue). To achieve this aim, we design simplified, minimal systems and experiments on cells under controlled mechanical conditions. My research interests lie in the understanding the molecular and physical principles that govern processes at the plasma membrane of cells. Particularly, by which mechanisms the force generating machinery of the cell cortex, structural filaments and motor proteins, govern and regulate the mechanical properties of the cell membrane and dynamics of cell membrane components, and vice versa, how membrane organisation and signalling events feed-back to the regulation of the cortex machinery. These mechanisms, which in turn regulate cell motility and cell-cell interactions, underlie important, poorly-understood human diseases that constitute global health problems. To study these processes systematically, our lab employs a combination of in vitro, reconstituted minimal systems and experiments on cultured cells to dissect and understand the interlinked contributions of membrane mechanics, cytoskeletal activity and membrane organisation. We use quantitative imaging approaches, controlled mechanical and biochemical manipulations and work with theoretical physicists to unravel the unsolved puzzle of mechano-sensing and cell membrane tension regulation. 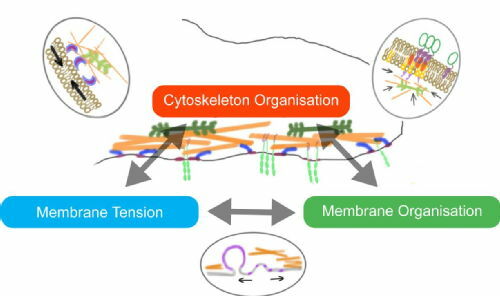 Köster DV, et al., Actomyosin dynamics drive local membrane component organization in an in vitro active composite layer. Proc. Natl. Acad. Sci. 2016, doi:10.1073/pnas.1514030113.